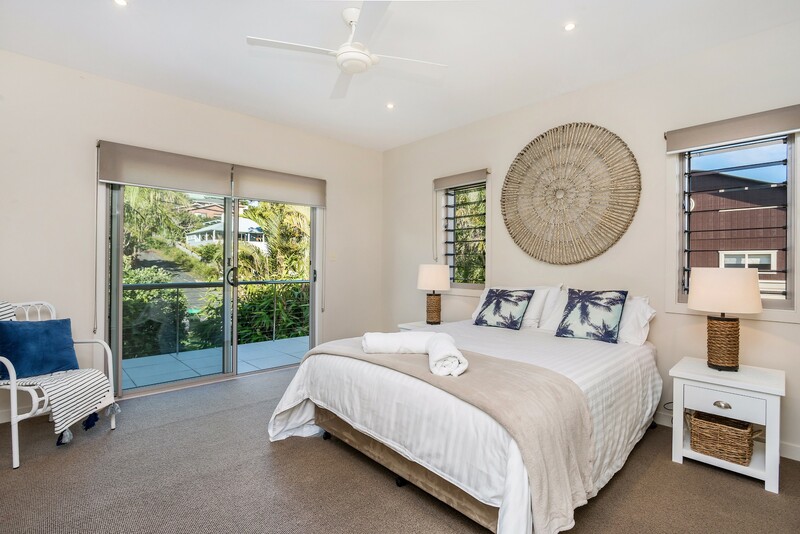 Byron Beach Style is a spacious 4 bedroom, 2-5 bathroom holiday home just minutes from the beach and Byron town centre. 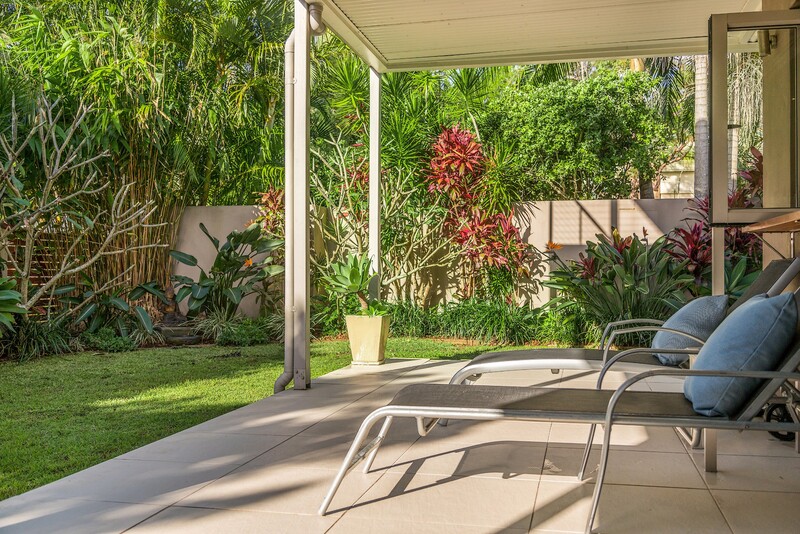 This family-sized house with its multiple accommodation options is surrounded by lush tropical gardens for absolutely privacy. 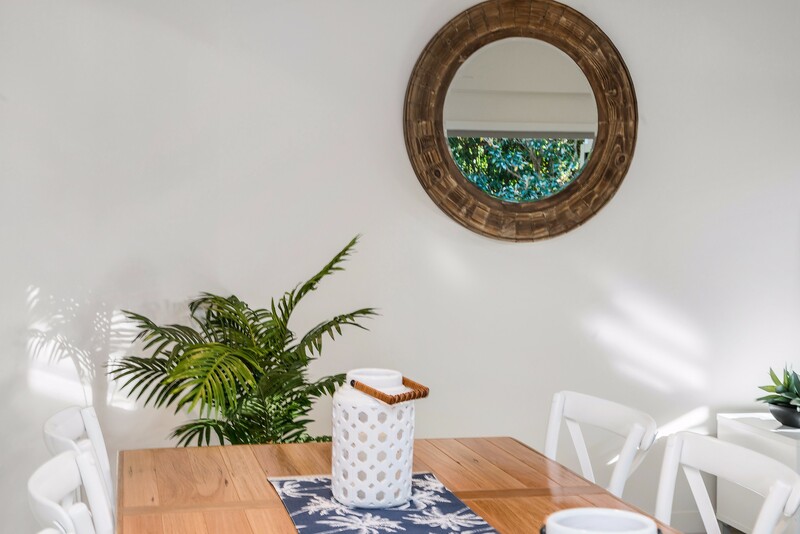 Ideal for holidays all year round, this luxury detached holiday home in Byron Bay combines beach, wildlife and cultural opportunities. 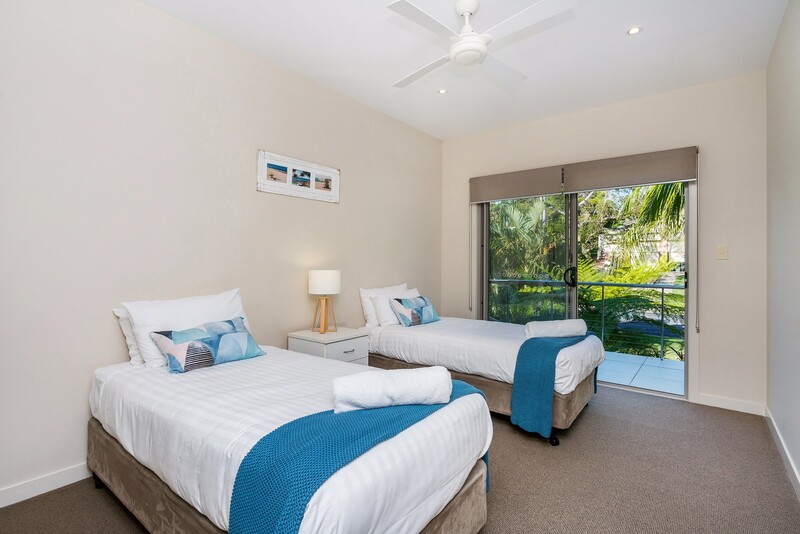 Go whale watching and dolphin-spotting from the famous lighthouse, play a round of golf, enjoy snorkelling at Julian Rock in the Marine National Park or chill out and play beach games on the beautiful sandy beach. 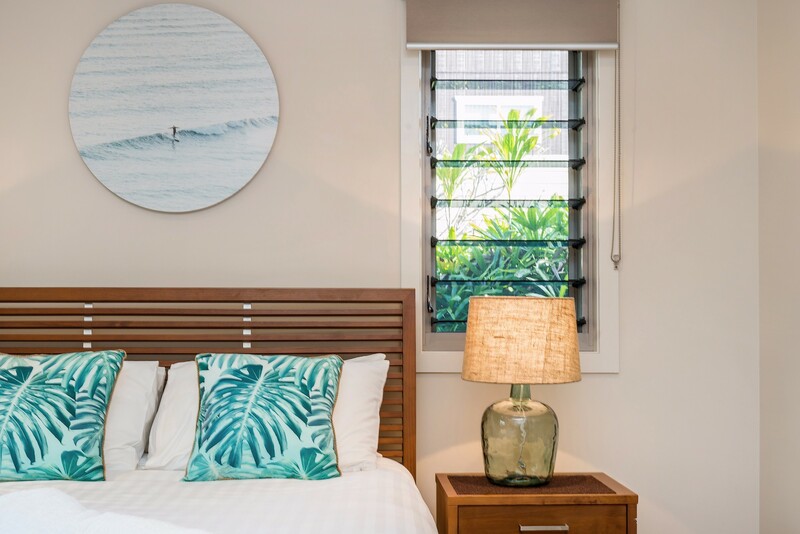 Enjoy sundowners from the Beach Hotel overlooking Main Beach before moving on to the restaurants and nightlife in Byron town centre. 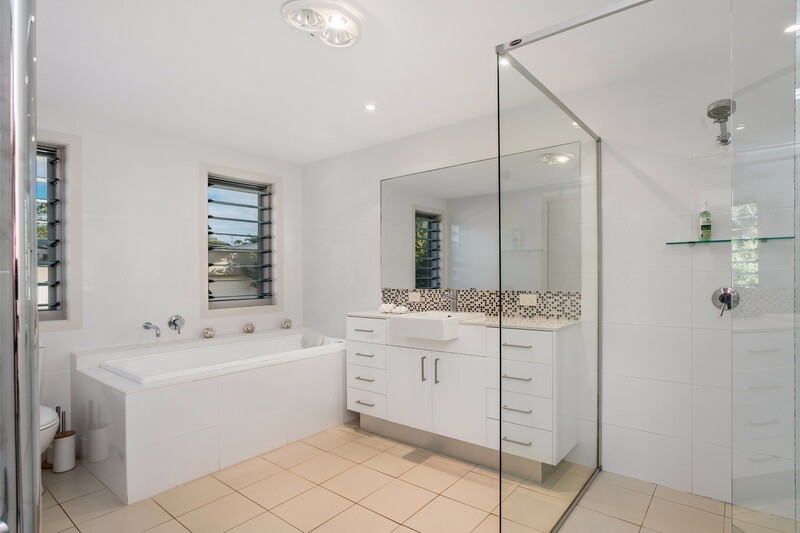 4 bedrooms and 2.5 bathrooms, sleeps 8. 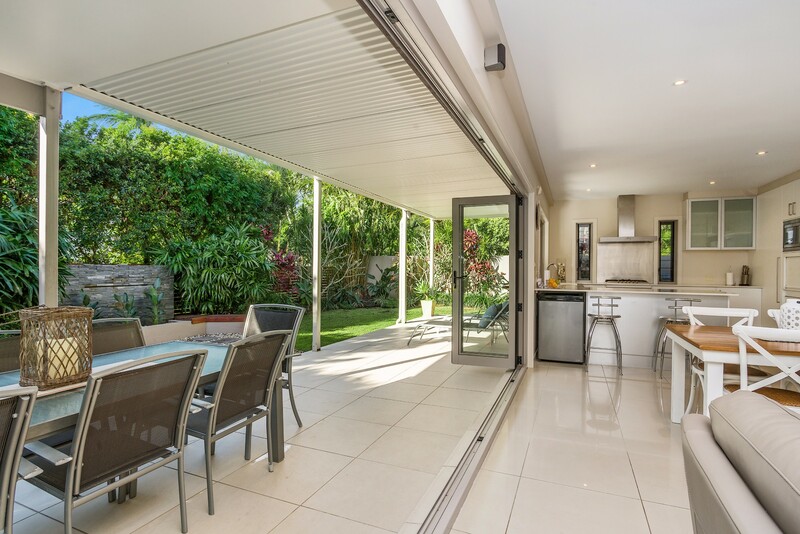 Open-plan living areas connect the kitchen and dining room with the outdoor terrace. 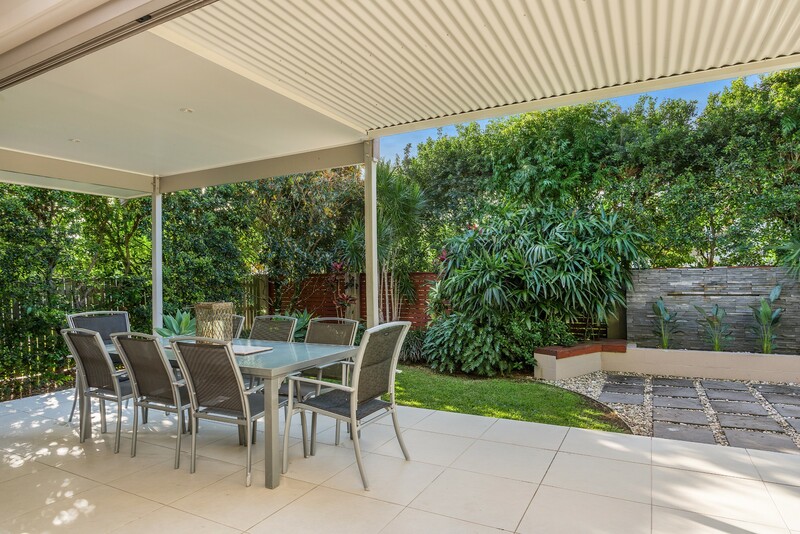 Dine casually at the breakfast bar, seated at the formal dining table or outdoors for a relaxed alfresco dining experience in the BBQ area. 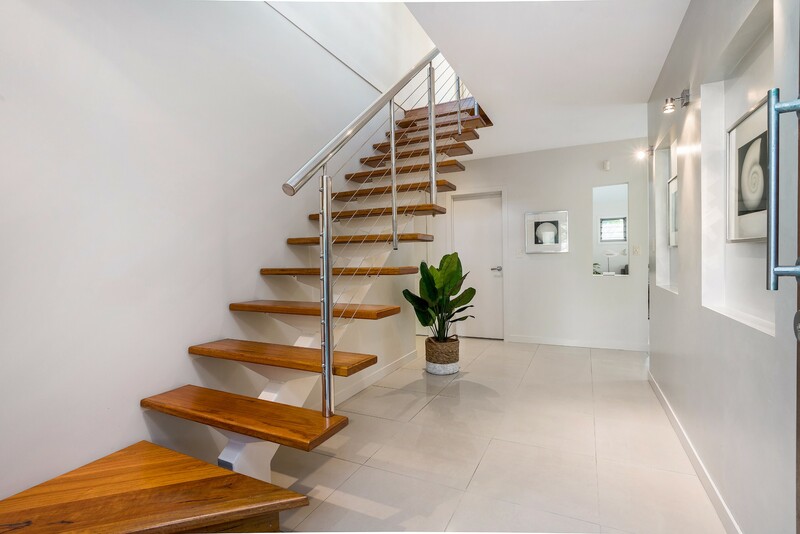 The TV lounge on the upper floor has polished wood flooring and cream leather sofas around the wall-mounted flat screen TV with Foxtel. 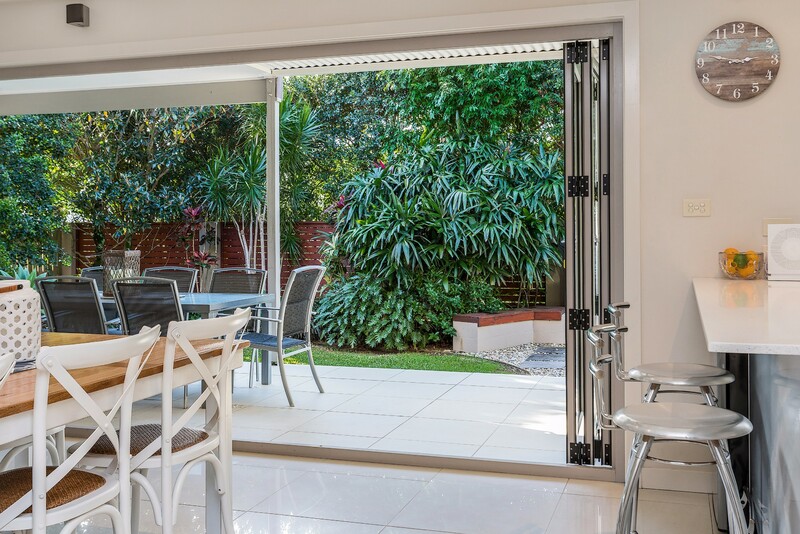 Bi-fold doors fully open onto the upper terrace for indoor-outdoor living. 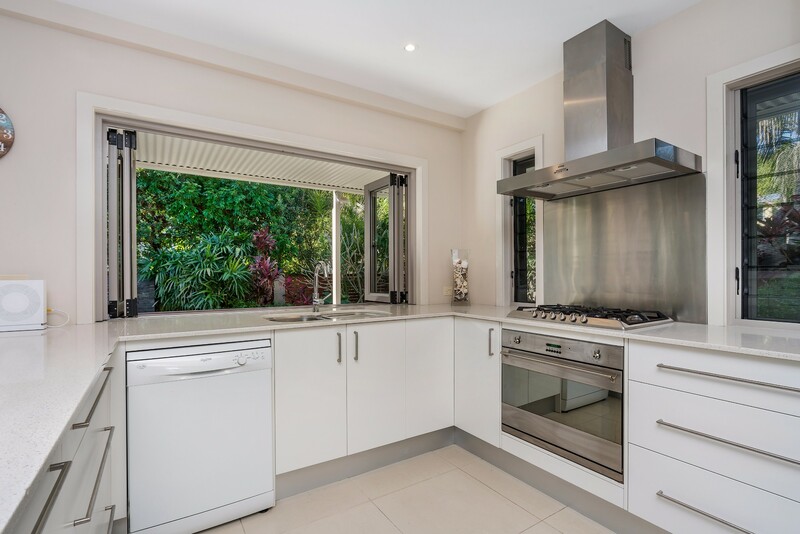 This modern all-white kitchen is fully equipped with gas hot plates/electric oven, dishwasher, microwave and 3 fridges to cater for families (including 2 bar fridges). The laundry makes life easy for families with a washing machine, tumble dryer and ironing facilities. 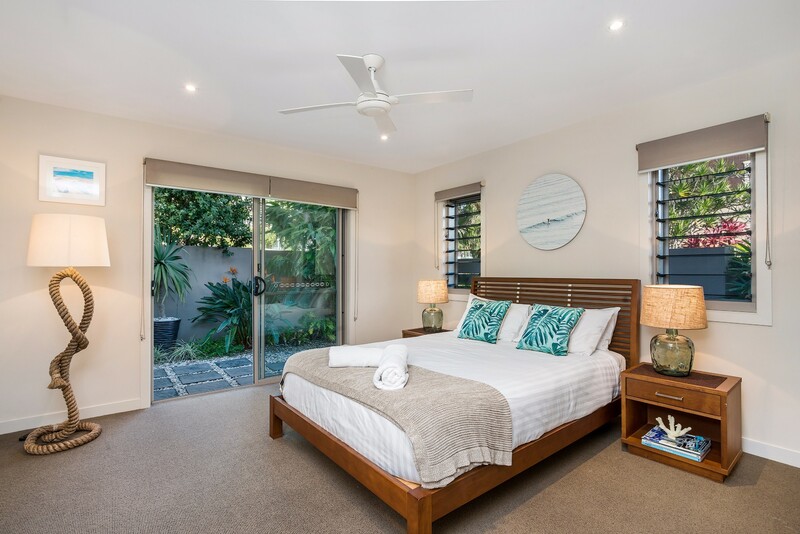 Generously sized bedrooms have built-in wardrobes, modern furnishings and tasteful decor. There is also a baby cot available on request (guests to bring their own linen). 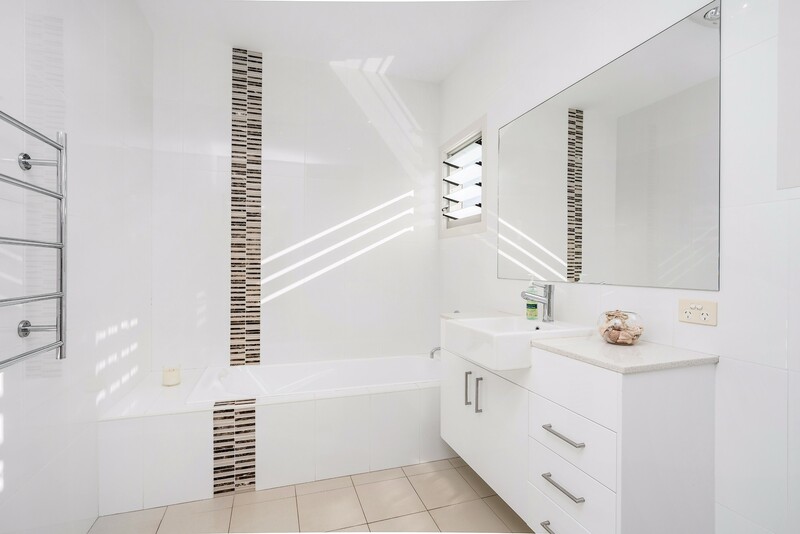 Two full bathrooms, both with bath tubs and main with spa bath plus a powder room. 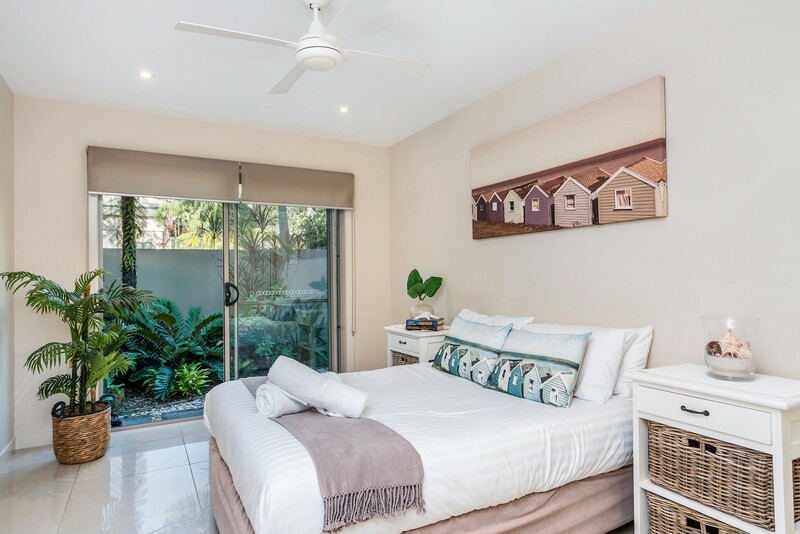 Byron Beach Style is the ideal holiday home in Byron Bay for relaxing on the covered terrace and cooking on the barbie while children play on the lawned area. 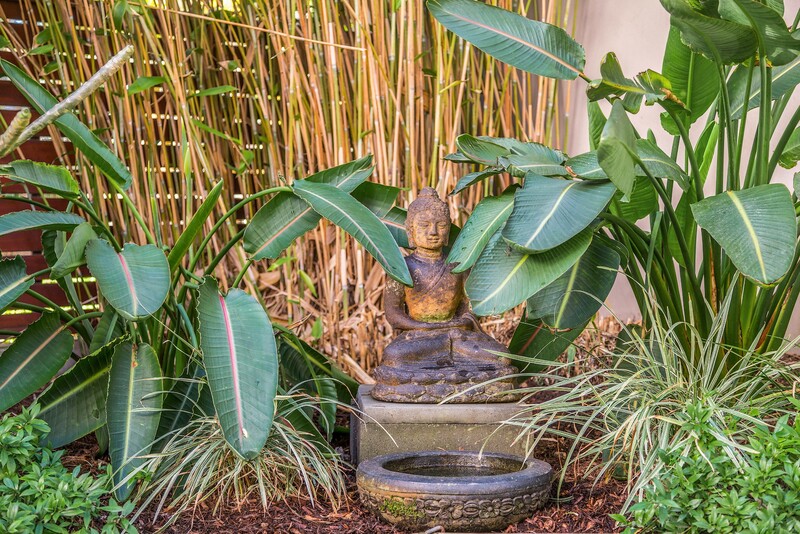 This fully fenced property is completely secure and private with lush tropical landscaping. 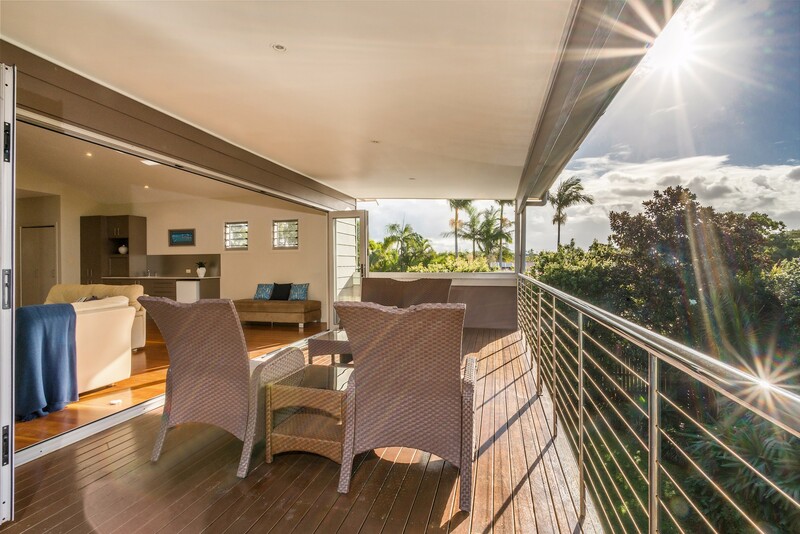 Two large covered terraces on different levels provide well-planned space for al fresco dining and entertaining overlooking the secluded gardens. 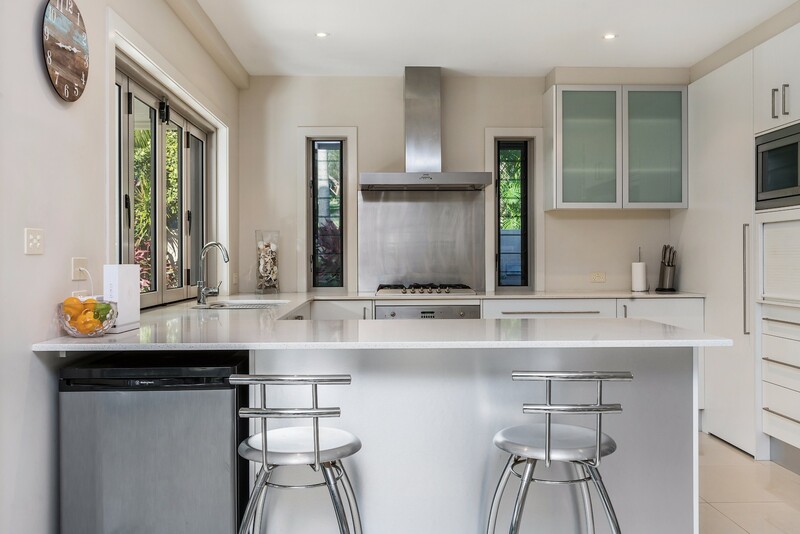 Families will appreciate the secure garden and first floor rumpus room with wet bar. Garage parking plus secure car parking space and off-road parking. 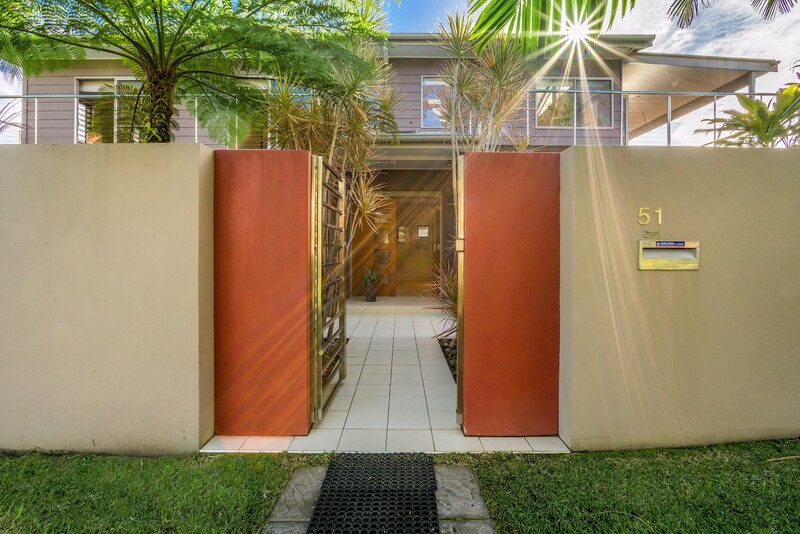 Enviably located within strolling distance of Byron town centre for shopping, dining and enjoying the relaxed café culture of this iconic town. 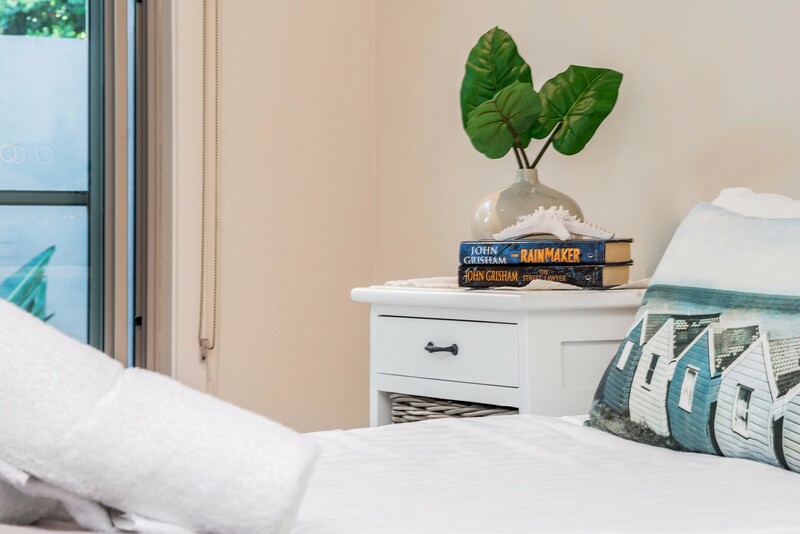 The beautiful sands of Clarkes Beach and the start of the world-famous Byron Bay lighthouse walk is an 8-minute stroll away from this spacious holiday home in Byron Bay. 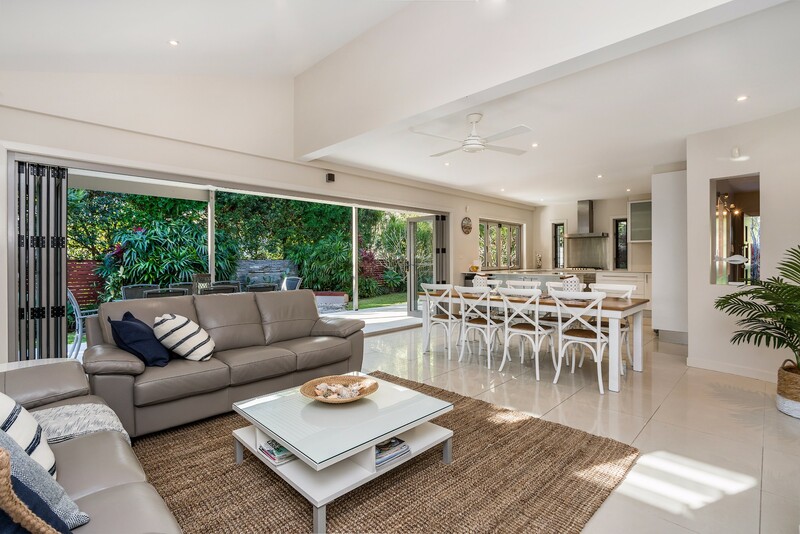 Great house in the perfect location, only 10 minutes walk into Byron and the beach. Was nice having dinner with our family and chilling out. Well stocked house. Could use more silverware, forks in particular with no salad forks provided. Location is nice as we were able to walk to most everything. 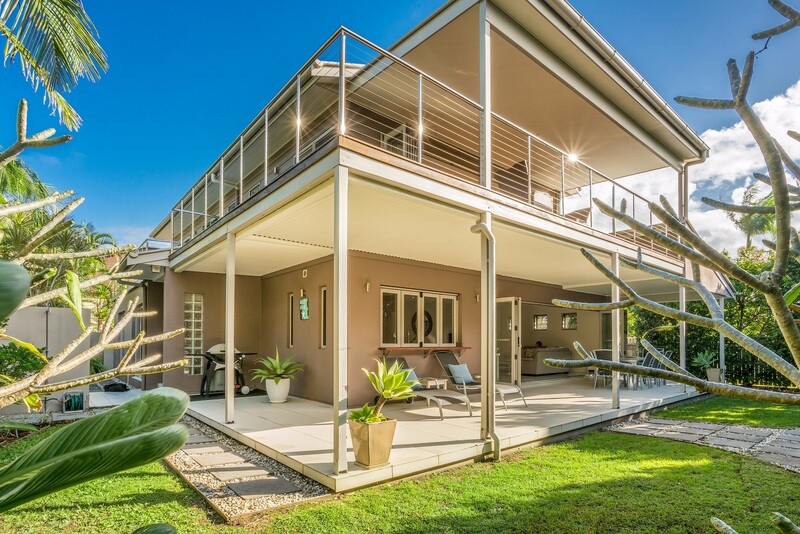 We loved our property in Byron. Was a fantastic size, everything was supplied and we just had a ball.